Frying your favorite meats and foods is a breeze with the Mauviel M'heritage M'150 frying pan. It's made from 1.5mm thick copper with stainless steel interiors. 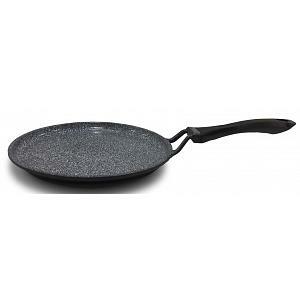 The round fry pan has straight edges and a comfortable stainless steel handle, fixed with rivets. 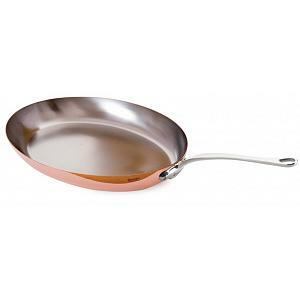 An ideal blend of copper and stainless steel enhances the pleasure of cooking. The copper provides ideal heat conductivity and control. You'll be able to use this amazing frying pan on gas, electric, and halogen stoves. And, you can put it in the oven too! 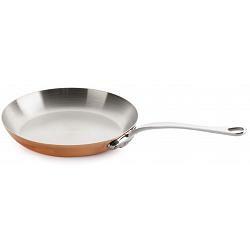 The Mauviel M'150 frying pan in France and has a lifetime warranty. The pan measures 26cm / 10.26 inches.